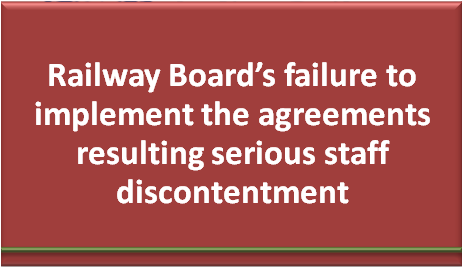 Sub: Railway Board’s failure to implement the agreements resulting serious staff discontentment — kind intervention — requested. Ref: NFIR’ s letter No. 11/95/2018 dated 05/04/2018. (a) Replacement of 6th CPC Grade Pay 4600/- with Grade Pay 4800/-. (b) Upgradation of Apex Level Group ‘C’ posts to Group ‘B’ Gazetted (3335 posts). (c) Merger of Technician II with Technician I. (d) Allotment of 6th CPC Grade Pay 4600/pay level 7 to Loco Pilot (Mail/Exp). (e) Stepping up of pay of Loco Inspectors inducted prior to 01/01/2006. (f) Implementation of 10 : 20 : 20 : 50 ratio to Track Maintainers in GP 2800, 2400, 1900 & 1800 respectively. 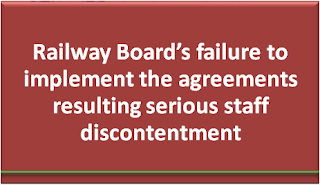 NFIR also conveys that the Railway Staff (Supervisors and Supervised) are greatly dissatisfied over non-compliance of the agreements reached with the Federations on the above listed items. The Federation however still hopes that you would give topmost priority for ensuring implementation of commitments, which would contribute for improving the satisfaction level among rank and file of Rail Workforce. NFIR at the same time requests you to kindly direct the Railway Board to send replies to Federation’s letters promptly which would also facilitate improved healthy industrial relations. Implementation even after several years:- (a) Replacement of 6th CPC Grade Pay 4600/- with Grade Pay 4800/-. (b) Upgradation of Apex Level Group ‘C’ posts to Group ‘B’ Gazetted (3335 posts). (c) Merger of Technician II with Technician I.